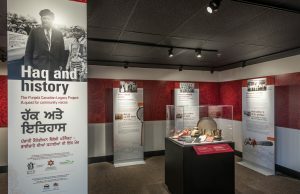 Since 2014, the South Asian Studies Institute has partnered with the Royal BC Museum to record, narrate and include in a historical record the stories of Punjabi settlers in the Province of British Columbia. To date, the SASI and the RBCM have collected interviews and archives of 148 Punjabi families across the entire Province. Recently, this partnership work (titled the Punjabi Canadian Legacy Project) has been highlighted in local media. VICTORIA, BC– Nearly one million people came to Canada from the Punjab region in the twentieth century. But who were these individuals, and what were their experiences like? 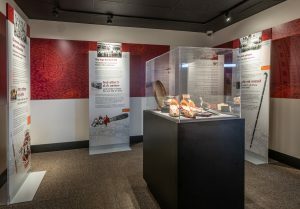 A new (and free) Pocket Gallery display at the Royal BC Museum, Haq and History, offers visitors the chance to hear stories from and about these immigrants and see rare objects that chronicle their lives, including details about work, home life and keeping cultural traditions alive in BC. 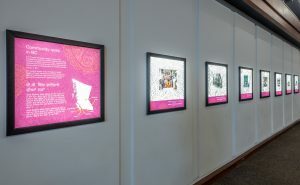 Through videos, panel text and artifacts, visitors to Haq and History will learn about Punjabi immigrants working in sawmills in the 1920s; hear about travel from Punjab to Canada in the 1950s; learn some of the challenges of sourcing Indian food in Vancouver in the 1960s; and eavesdrop on memories of life in the now-abandoned town of Paldi in the 1940s. Haq and History is the latest collaboration of the Royal BC Museum and the South Asian Studies Institute at the University of the Fraser Valley. In 2015 the two organizations, with strong and consistent community input, began a project to explore Punjabi Canadian community voices in British Columbia, from the first arrivals to the present day. The Pocket Gallery occupies a corner “pocket” of the museum’s ground floor Clifford Carl Hall and is easily accessible, for free, to all visitors during opening hours (10:00 am to 5:00 pm, seven days a week). 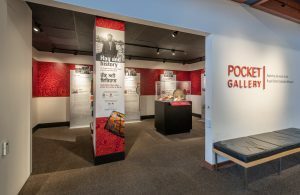 The Pocket Gallery was originally envisioned, in early 2016, to cast a bright light on the amazing array of Royal BC Museum collections, research and conservation work that visitors rarely get to see. Jack Lohman, CEO of the Royal BC Museum. Satwinder Bains, Director of the South Asian Studies Institute at the University of the Fraser Valley.